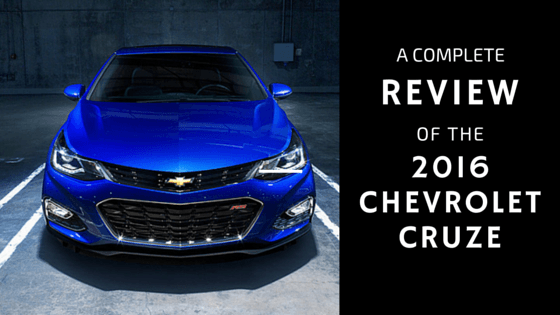 The 2016 Chevrolet Cruze is without a doubt one of the top performing compact cars on the market today. In fact, Car and Driver ranks the Cruze as top in its class overall, beating out the Mazda 3, Honda Civic, Volkswagen Golf and Ford Focus, to name a few. With six models and countless options to choose from, there are so many factors to consider when it comes to selecting the right vehicle to suit your lifestyle. From the basics, like manual vs. automatic transmission, to the more advanced options, like the rearview camera and steering wheel controls, the Cruze can provide whatever it is that you need in your vehicle. The Cruze is available in several different options. The one that works for you will depend on many things like driving style, personal preference, driving frequency and purpose of the vehicle, budget and more. If you’re looking for a manual-transmission vehicle, you have three different options: the L, LS, and LT. If you’d prefer an automatic transmission vehicle, you’d be looking at these options: LS, LT, and Premier. The L model is our base model that offers reliability, affordability, and style. Then, we have the LS and LT models. Aside from the transmissions, the LS models have similar specs, as do the LT models. Our Premier model gives you the option to take home your dream vehicle, at a dream price – this one comes with all the bells and whistles you’re looking for. The LT boasts a lot of available upgrades that will provide a sleeker look like a rear spoiler and power sliding sunroof. There are also other available options like a premium Bose 9-speaker system, keyless access and rear park assist that can take your vehicle to the next level. The Premier comes standard with several luxury features such as remote start, heated seats, SiriusXM Satellite Radio, leather-wrapped steering wheel with built-in controls and mounted audio phone interface controls, keyless entry, rear-view camera and more. If you’d like to talk about purchasing an extended warranty for your Cruze, speak with an Eagle Ridge employee, who are always happy to assist you in any way possible. The Chevy Cruze is very efficient when it comes to fuel. Boasting an impressive 5.8L/100 km (average) highway and 8.0L/100 km (average) city, it’s among the best in its class. Something to keep in mind to keep your vehicle performing at that top fuel efficiency is making sure you get regular oil and filter service. Your Chevrolet Cruze will be equipped with the Engine Oil Life System (OLS). The OLS monitors the speed and engine temperature to continuously sense operating conditions to help determine when you need to change your oil. Your OLS also monitors your personal driving habits and the climate you live in. With your busy lifestyle, it can be hard to remember when your car needs to be serviced and what services you need. With a Maintenance Plan, you can ensure that your Cruze is covered. You can choose between Essential Care and Enhanced Care. Both plans work alongside your Owner’s Manual maintenance schedule. For more information on Maintenance Plans, take a look at the overview on the GM website. Here, you can compare and contrast both plans to choose the one that’s best for you and your vehicle. If you’re looking for a great all-purpose sedan that has great fuel efficiency and appealing to the eye, the 2016 Chevrolet Cruze is the vehicle for you. Now until June 30th, get $750 instant cash back when you purchase a Chevrolet Cruze from Eagle Ridge Chevrolet, Buick, GMC! Click here to build and price your dream vehicle!